Summer 2001 Jacob Klaris hadn't succeded in coming to the Alps, and by the end of the year it was last chance to make a climb here. Failing anything better he succeeded in persuading me to go to the Bernese Alps for five days between Christmas and New Year, thus making his first winter climb. 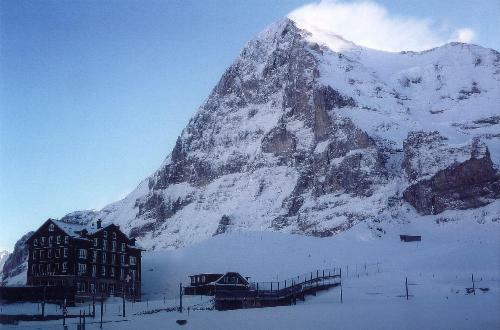 We arrived on December 26 to Kleine Scheidegg in heavy snowfall and stayed one night here before we next day moved up to Jungfraujoch. That day weather was fine, but after having stayed there a few hours I had a feeling that the fine weather wouldn't last, så we returned to Kleine Scheidegg for one more night.